Attractive wall desks can neatly organize various materials. You can maximize your space challenged office with the convenient folding design of the wall desk. This is a desk anyone can love! The beautiful and durable contoured “wrap around” laminate covers all surfaces for easy cleaning. 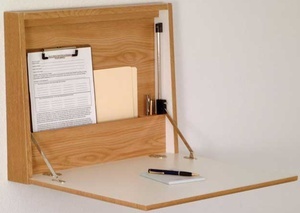 Each desk is outfitted with a useful pocket and pen holder inside. These are great to use for personal convenience, or to add to the convenience of the reception or lounge area in your facility. Braking slides are inserted for a "soft opening" and they give support while not letting the front panel "slam down"